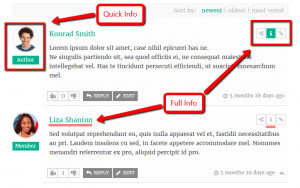 WordPress Comment System has a lack of information about comment authors, people only see commenter name and avatar. 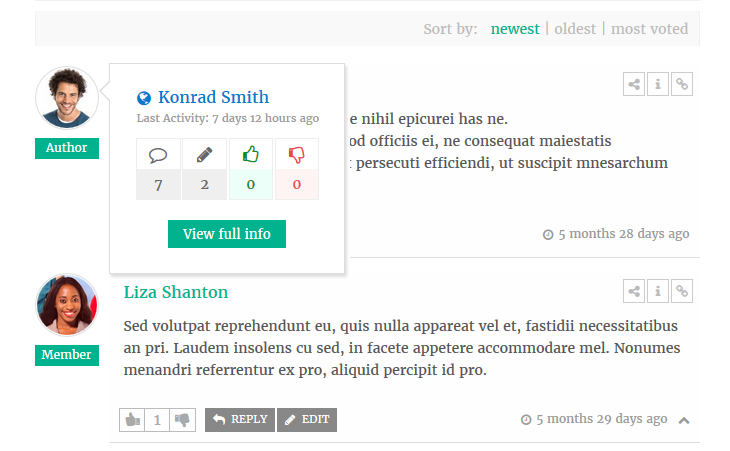 wpDiscuz Comment Author Info addon is designed to provide extended details about comment authors. 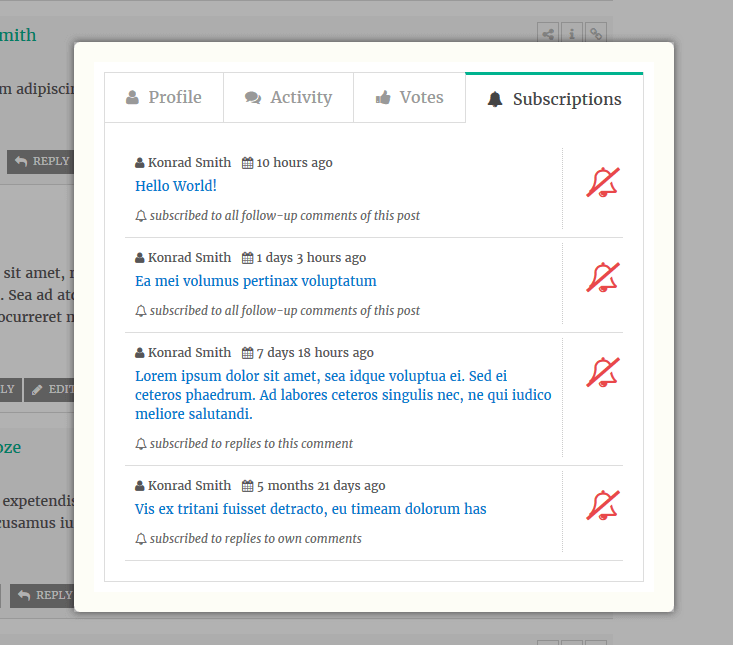 Using this addon people will be able to see comment author extended profile, activity, votes and subscriptions. Click on comment author info icon and open pop-up window with according tabs. 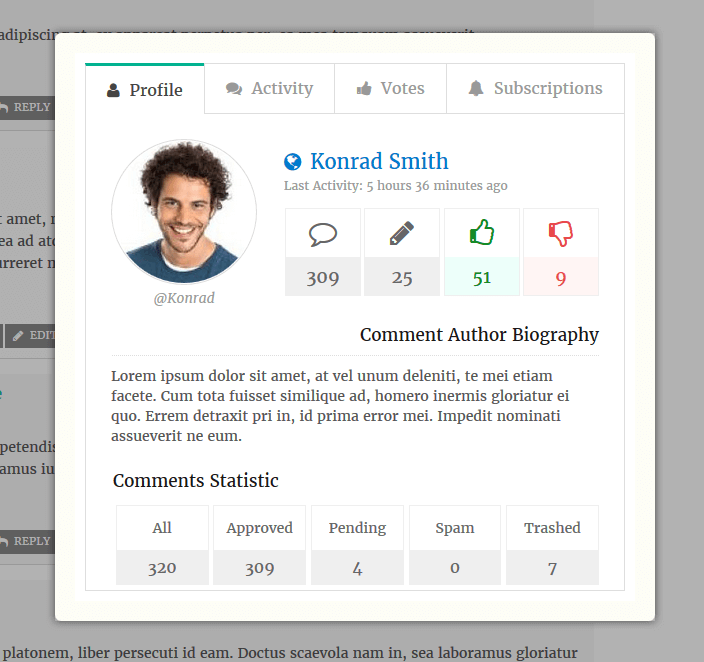 In Profile tab you can see commenter quick statistic (number of comments, posts, likes, dislikes), biography, etc… In Activity tab all comments of this author, in Votes tab: all voted comments and in Subscriptions tab: all type of subscriptions to new comments. 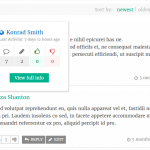 wpDiscuz Comment Author Info addon provides an extended details about comment authors. Hover on Comment Author Avatar to open Quick Info and click on Author Name or on Comment [ i ] icon (top right corner of each comment) to open Full Info. Detailed statistic about number of approved, pending, spam and trashed comments. 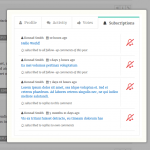 Allows to see all own subscriptions and to unsubscribe using according button next to each item. 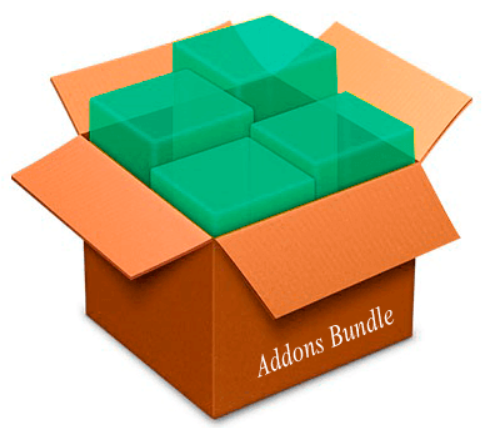 Addon comes with many options, which allows you to have a full control over all features on front-end. 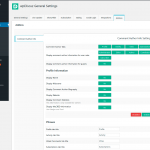 Options to display/hide each profile information separately (name, website, biography, etc..). Is the a way to unblock not confirmed eMail adresses from not registered useres? You just subscribed for new comments on our website. This means you will receive an email when new comments are posted according to subscription option you’ve chosen. So if a not registered user want to follow the thread but click not of the activate button or forget it his eMail will be blocked in the future. Please note guests are not able to follow users at all. Also if the user doesn’t Confirm Follow the email will be re-sent automatically. This has no any relation to wpDiscuz Comment Author Info addon. It’s default wpDiscuz feature. 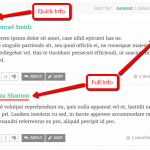 wpDiscuz Comment Author Info addon is designed to provide extended details about comment authors. 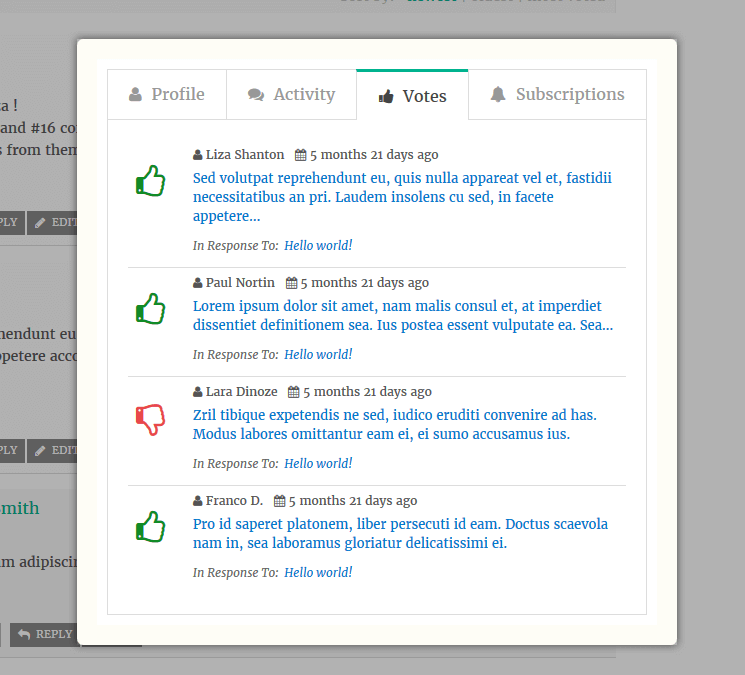 Using this addon people will be able to see comment author extended profile, activity, votes and subscriptions. Astghik, thnx for your fast reply. I try to explain my question from a other side. If you want to leave a comment you can do this. you have to insert your name and your eMail in the comment formulare. and if you want you can follow the thread or the comments to your comments (not follow the users!). 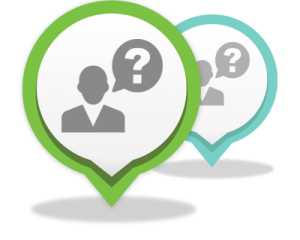 So my question is can I see this unregistered peoples in the database of our product “wpDiscuz Comment Author Info”? If so I would buy it. If people come to our side – and pls remeber they can`t registered or login – and leave a comment – AND want to follow these thread, they got a eMail to subscribe. so far so good! If they dont answer to this eMail (maybe because they forget or the eMail is in the spamfilter) and come back to our side after maybe 3 weeks, leave a new comment and want to follow these new thread they get a error msg! (because her eMail is blogged by wpdiscuz). so far so good! These users write us an eMail and told us the problem and want that we unblock her eMail-Adress. So we dont know where to look because there is not database frontend where we can see this emails and there status. 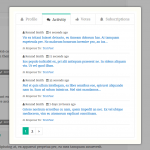 you need to check wpDiscuz Subscription Manager addon. 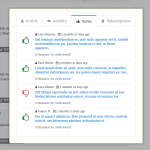 You can monitor and manage all subscribers from dashboard. 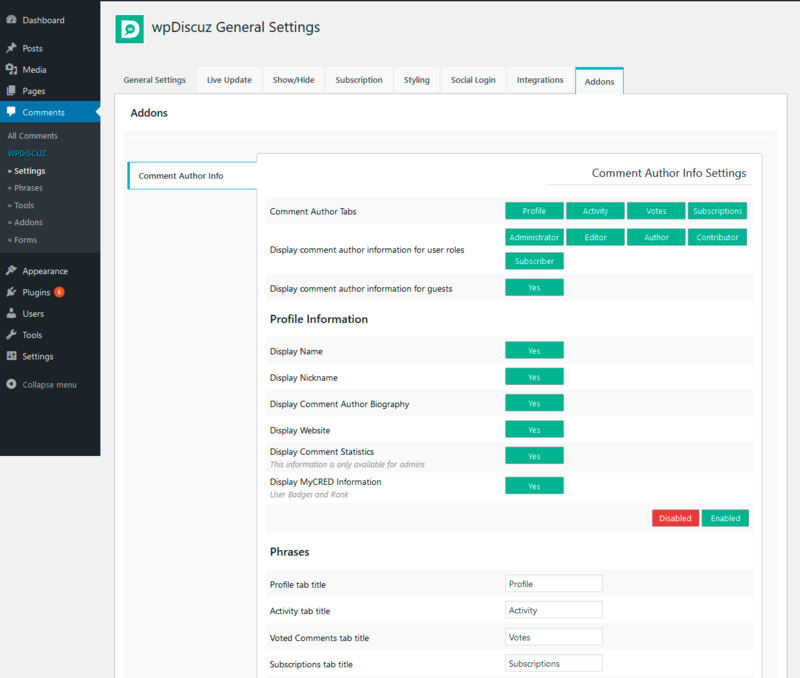 As you mention in your post you don’t allow users to register or log in, so all users list you’ll find in Dashboard > Comments > Subscriptions admin page. 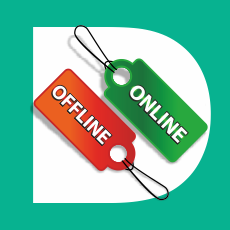 Also, we’ve already added in our to-do to allow filtering subscribers ( display the registered users or guests only ). 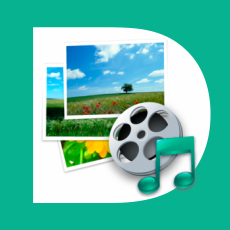 Can users change their Avatar using this plugin? I’m sorry but not. This plugin is designed to display user information. This doesn’t add user data management features. 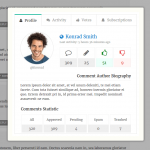 Avatars and other profile data should be edited in Profile Plugins or in Dashboard. It is possible to hide avatar without wpDiscuz Comment Author Info addon. Please navigate Dashboard > Settings > Discussion, disable “Show Avatars” option. Is there a way to show “full-info” of user below avatar instead of embedded in a hidden popup? I would like to see “# of comments / date user joined / # of mycred points”. 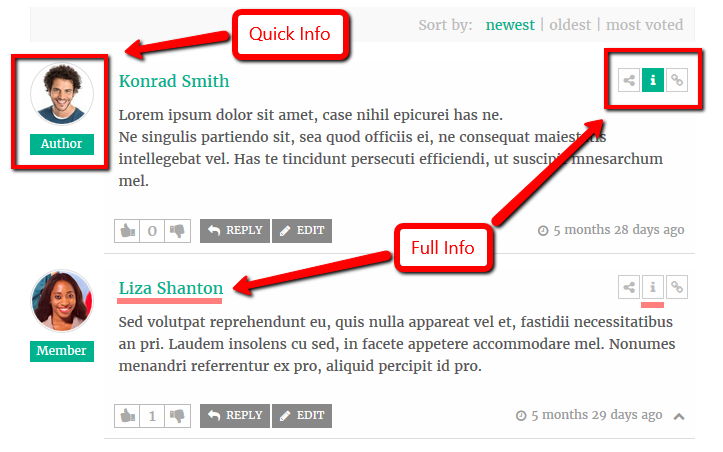 Basically I like the way that this information is shown on WPForo, but the WPDiscuz takes this info away and hides it. I’m really sorry but there is no way. We’ll take this under consideration and add in future update to-do list. Can i pay to have this custom done ? 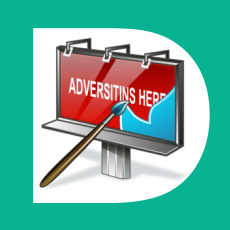 This is one of the few things I am waiting on before launching my website. What would be the price for adding comments tab to buddypress profiles just like in your wpDiscuz Comment Author Info add-on – the same way, but as a tab in buddypress? 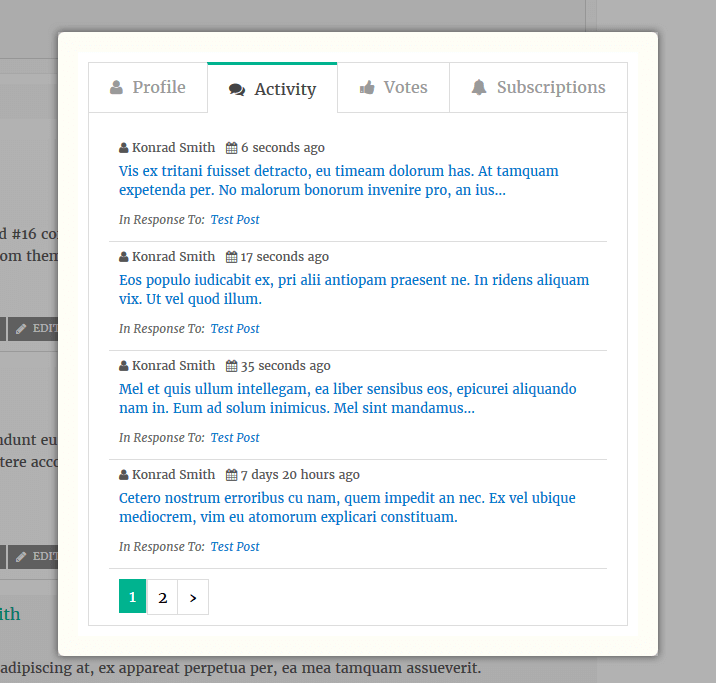 As far as I know BuddyPress has a tab for user activity including comments. Is there a way I can show this information within the users buddypress profile? Can I copy the template code and add it to a profile tab? I’m sorry but not. There is no update save way to do such customization. 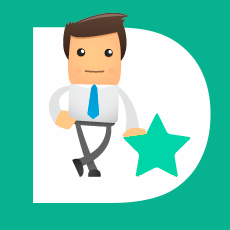 Pls is it possible for a user to follow a particular author ? Thank you for this suggestion, this is already in our to-do list. I’ll provide ETA soon.